supposedly subject to Ofsted inspection. The report also claims that some of these schools teach "repugnant"
beliefs about the wickedness of Western society and Jews. commission from Civitas, will provoke ritual cries of "Islamophobia"
hate-mongers, including supporters of Al-Qaeda. some of it in Arabic, that might unjustly damage someone's reputation." more limited existence inside the Muslim enclaves." The consequences for bright Muslim British girls are absolutely dire. wider world that informs their citizenship." "hugely overshadowed by a rapidly growing sector of Muslim institutions. Of late, Mr Pranab Mukherjee has been adopting a tone and tenor worthy of the Foreign Minister of a great nation like India while dealing with a rogue state like Pakistan, which has made sponsorship of terrorism a key instrument of state policy. But if Mr Mukherjee is to take these threats to their logical conclusion and make our country terrorism-proof, he and the Union Government need to get an unambiguous signal from across the country that India will neither forget nor forgive Mumbai 26/11. This can happen only if we shake off the tentativeness and confusion that has permeated national discourse in regard to Pakistan, and come face to face with reality. Though Pakistan was created on the premise that Muslims constitute a separate nation, it broke up into two within a quarter century of its birth and most South Asian experts predict a further disintegration of that country. Second, unlike India, which has become a vibrant democracy, Pakistan chose to become an Islamic state and this had a major social and political impact. For example, on the social side, Pakistan has virtually extinguished its Hindu population. The Hindus, who constituted 25 per cent of Pakistan's population at the time of its birth, are now reduced to just 1.64 per cent. On the political front, the absence of democracy has encouraged the Army to often take control and to display belligerence towards India to retain its hold on the Government. Often, even when there is a civilian Government, the Pakistani Army has resorted to unilateral military action. It made the first attempt to grab Indian territory when it sent in infiltrators into Jammu & Kashmir in October 1947. Instead of following the advice of top class military men like Field Marshal Cariappa and Gen Thimmiah, Prime Minister Jawaharlal Nehru foolishly rushed to the United Nations complaining about Pakistan's aggression. The UN promptly ordered a cease fire and India lost 30,000 square miles of territory to Pakistan. Indians soon forgot what Pakistan had done. Worse, they even forgave Pakistan for this act of aggression. This suicidal Indian trait tempted Pakistan to do an encore in August 1965. The Indian Army pushed back the infiltrators and captured strategic positions in Haji Pir and Tithwal areas to effectively prevent further incursions. This clash resulted in a war, which concluded after the UN called for a cease fire. As the hostilities ended, Pakistan's Foreign Minister Zulfiqar Ali Bhutto swore in the Security Council that Pakistan would launch a 'thousand-year war' against India. When the Indian delegation walked out in protest, Bhutto said, "The Indian dogs are going home." This may seem incredible, but soon after Mr Bhutto showered these abuses on us, we bartered away the key territorial acquisitions at the negotiating table at Tashkent. This encouraged Pakistan to attack India yet again in 1971 when the latter objected to the brutality unleashed by the Pakistani Army in what is now Bangladesh, leading to the influx of 20 million refugees into our country. This led to a full-scale war in which the Pakistani Army was disgraced. India captured 93,000 Prisoners of War and 5,000 square miles of territory. But all this was returned to Pakistan by Prime Minister Indira Gandhi during the Simla Summit without reclaiming even a part of the 30,000 square miles of territory that we lost in 1947. Everything was given back on a platter to Mr Bhutto, who by now had become Pakistan's Prime Minister. Why? Because we did not want to 'humiliate' this uncouth politician who had classified us as 'dogs'! We would never have suffered the embarrassment of 26/11 if only we were in the habit of reminding ourselves and every successive generation of Indians of Mr Bhutto's abuses and bravado. Strangely, even those who appeared wise when they sat in the Opposition benches have made terrible compromises on national security. The prize for the best somersault by an Indian politician vis-à-vis Pakistan goes to Mr Atal Bihari Vajpayee. He had opposed the policy of appeasement followed by the Governments of the day after the 1965 and 1971 wars and scoffed at then Foreign Minister Swaran Singh for saying that the Simla Accord was the 'first step' towards durable peace. Speaking in the Lok Sabha on July 31, 1972, Mr Vajpayee had said: "In the last 25 years, we have always been taking the first step. We took the first step when Nehru met Liaquat Ali Khan, then yet again when Nehru met Ayub Khan. We again took the first step when Shastri met Ayub Khan at Tashkent. And now, again at Simla we are taking the first step. How many times do we keep taking the 'first step' towards durable peace with Pakistan?" Twenty-seven years later, Mr Vajpayee became the Prime Minister. It was now his turn to forget and forgive. Succumbing to pressure, Mr Vajpayee started speaking the language of Swaran Singh. So he ventured on an ill-advised bus ride to Lahore that culminated in that spurious bear hug with Mr Nawaz Sharif. Pakistan returned the compliment by invading Kargil. We lost hundreds of brave soldiers while reclaiming our territory. Soon thereafter, Mr Vajpayee was again under pressure and he invited Gen Musharraf to Agra for an ill-fated summit. Pakistan gave us a return gift by way of the assault on our Parliament House on December 13, 2001. In a short span of three years, Pakistan betrayed Mr Vajpayee thrice. Now that the Congress is back in power and is, as usual, under the influence of many resident non-Indians, those of us who wish to secure India for posterity need to remind the Government of the following: If we had not forgotten the loss of 30,000 square miles of territory in October 1947, August 1965 would not have happened; if we had been firm and unyielding in 1965, Pakistan would not have had the courage to wage war on us in 1971; if we had driven in the knife in 1971, when we had 93,000 Pakistani Prisoners of War and territory, Pakistan would never have had the nerve to intrude into Kargil in 1999; if we had not forgotten Kargil, December 13, 2001 would not have happened; if we had not forgiven Pakistan for the audacious attack on our Parliament House, India would not have suffered the humiliation it did on 26/11. The terror attacks in Mumbai offers us yet another opportunity to get our act together to protect our unity and territorial integrity. But we cannot achieve this unless we shun the policy of forget and forgive when it comes to Pakistan. Extract of a letter to the Editor – in Janmabhoomi edition from Mumbai. I am a Muslim born and brought up here, studied here, grew up here and living happily with my family. This is my heaven. Today, I am a 65 year old man. Today, it is a matter of great shame that the terrorists who had created recent chaos are supported by Pakistan and traitors within our own country. Such an act of terror is not possible without the active support of traitors inside. Pakistan is unable to tolerate the progress made by India and that we live happily. We and the people of Pakistan or Bangladesh are all brothers of one family. Just like water cannot be separated by beating with a stick, our hearts also cannot be divided. In the same family, brothers and sisters do not attain same level of progress and all of us get our happiness and sorrows in our life as per the wish of Allah and as per our deeds. Such jealousy and envy, hatred and vengeance are not good. Many people defame our Chief Minister Narendraji Modi, but lot of Muslims in our State love him. He is only against anti-nationals and not against any particular community. Post Godhra incidents are natural and haven't 350 Hindus died then? Haven't 60-70 Muslims died in the recent cowardly attacks? Modiji had the courage and was the first one to come to Mumbai and declare help. We will go to the extent of saying that Chief Minister of every State; whichever government they may belong to ( there have to be other parties in true democracy ); should be like Modiji and so also the Prime Minister. I have grown old but, if I get cooperation, I am self- motivated to sacrifice my life for my beloved country. I am ready to bombard the camps of traitors Dawood and Masood – for the sake of my country. We are happy to report that some 200 ecologists, academics, scientists and religious leaders from around the world met on 25 and 26 November at the Linnean Society in London and sought to provide enough multi-disciplinary evidence to persuade the governments of India and Sri Lanka to ask UNESCO to designate the Gulf of Mannar a World Heritage Site. Martin Palmer, Secretary General of ARC and religion and ecology advisor made the announcement of nomination for Sacred Site status to His Royal Highness the Prince Philip, Duke of Edinburgh. Martin Palmer said, "Cosmologically and ecologically theGulf of Mannar is about as sacred a site as you couldget. Our suggestion is that it should be nominated asone of the very first internationally significant sacredsites, along with places such as the sacred mountains of China and other such hugely holy and ecologically significant places. I have every confidence the nomination will succeed." Following agreements reached at the IUCN World Conservation Congress in Barcelona last October, 'Sacred Site' is a now an international term of protection for sites that are spiritually, religiously, culturally and ecologically important. IUCN, the International Union for Conservation of Nature, is world's oldest and largest global environmental network - a democratic membership union with more than 1,000 Government and NGO member organizations, and almost 11,000 volunteer scientists in more than 160 countries - it helps find pragmatic solutions to pressing environment and development challenges. We, at Living Planet Foundation and the Gulf of Mannar World Heritage Site Campaign are delighted with this nomination, which is a historic first and boosts our Campaign with new energy and new momentum! We believe that the Sacred Site nomination by ARC can only advance the cause for which we have been campaigning for the past 4 years – protecting the Gulf of Mannar and those whose lives are threatened by the Sethusamudram Shipping Canal Project. Following the London meeting, on November 29, our delegate from Bali, Dr. I Gusti Ngurah Arya Wedakarna, Prince of Dalem Benculuh Tegeh Kori, personally handed the Resolution to Mrs. Pratibha Patil, India's President who was on an official visit to Bali. Environmental Law and Development (FIELD), Romulus Whitaker and the UK office of ICOMOS made detailed and focused presentations at the meeting. It would only be appropriate here to thank all of them. the U.S and Europe, I was similarly inspired by the passion and generosity of so many concerned people. In that spirit, I hope you'll continue to support the Gulf of Mannar World Heritage Site Campaign. Contribution of any size makes a very real difference. Our campaign is not over, yet it is not endless. We do not know the day of final victory, but with the nomination from ARC, we have seen the turning of the tide. Now, we need your continued support if the Gulf of Mannar - and perhaps the planet - is to survive and thrive. From my family and my Campaign team to yours, we hope you have a happy, healthy holiday season. NEW YORK: At the first international meeting of the campaign to protect the Gulf of Mannar, held at the Linnean Society in London recently, the Alliance of Religions and Conservation (ARC) made the dramatic announcement that it would be seeking to have the Gulf of Mannar designated as one of the world's first internationally recognized 'Sacred Sites.' Following agreements reached at the IUCN World Conservation Congress in Barcelona last month, 'Sacred Site' is a now an international term of protection for sites that are spiritually, religiously, culturally and ecologically important. In the fight to save the Gulf of Mannar from destruction by the creation of a deep shipping channel, the move could prove to be a strategically important one. Flowing between South-East India and Sri Lanka, the Gulf of Mannar is home to Ram Sethu, or Adam's Bridge, a site of immense spiritual significance to both Hindus and Muslims worldwide. Situated in South-Asia's largest biosphere reserve, it is also one of the last remaining biological hotspots on the planet, offering sanctuary to numerous endangered plant and animal species such as the dugong and the green turtle. However, despite the clear cultural, natural and spiritual importance of the area, and in the face of an on-going challenge in the Supreme Court of India, the Indian government is pressing ahead with dredging for the planned Sethusamudram Ship Channel, risking destruction of the sacred bridge and the fragile eco-system of the area. Cosmologically and ecologically the Gulf of Mannar is about as sacred a site as you could get. Our suggestion is that it should be nominated as one of the very first internationally significant sacred sites, along with places such as the sacred mountains of China and other such hugely holy and ecologically significant places. I have every confidence the nomination will succeed." Organizers of the campaign to protect the Gulf of Mannar have been quick to welcome the news. "Mr Palmer's announcement was dramatic and unexpected," says Kusum Vyas, founder of The Living Planet Foundation, based in Houston, Texas, which organized the London meeting. "The meeting erupted into applause when he made the announcement - it was so thrilling. To get the Gulf of Mannar recognised on the international conservation stage will be a huge step forward in preserving its sanctity and ecology for future generations. We can't thank ARC enough." Asked to reflect on the current battle to preserve the Gulf of Mannar, Palmer said: "It is a classic struggle - to use Christian terminology - between God and Mammon, between those who see the world as a stage upon which a drama of cosmological significance is played out in which every aspect of creation has significance and meaning because it is created from love, and those who simply see this planet as a rather large supermarket to be raided." ARC is a secular foundation designed to work both with the major religions, encouraging them to look into their own traditions in order to increase their environmental activities, as well as with major environmental organizations to get them to take the role of religions seriously. IUCN, the International Union for Conservation of Nature, is world's oldest and largest global environmental network - a democratic membership union with more than 1,000 government and NGO member organizations, and almost 11,000 volunteer scientists in more than 160 countries - it helps find pragmatic solutions to pressing environment and development challenges. The first international meeting of the campaign to protect the Gulf of Mannar was held at the Linnean Society in London last week and was organized by The Living Planet Foundation USA. Pune (Maharashtra): In a hard-hitting editorial in Shiv Sena mouthpiece Saamna published yesterday, Shiv Sena chief Bal Thackeray demanded the public execution of Mohammed Ajmal Kasab arrested in the recent Mumbai terror attacks. Thackeray said that there was no need for Kasab to be put on trial as his involvement in the terror attacks is clearly visible. Kasab should be hanged publicly outside the Taj hotel and in front of the Gateway of India, he continued. Why should the alleged terrorist Kasab be given the opportunity of legal defense and present his side of the story, Thackeray asked in the editorial. Lawyers here are of the view that if Kasab has to be hanged, then the legal procedures of the country have to be followed. "What evidences are being collected against Kasab and what investigations and talk of legal procedures are being talked about," Thackeray questioned. "The entire world has seen the human massacre committed by Kasab and his colleagues. The terror acts committed by Kasab and other terrorists were captured on the television and still cameras. This is enough evidence, and does not warrant trial of the terrorists," Thackeray said. The Sena chief warned lawyers that if they tried to represent Kasab in the courts, then the Sena workers would not spare them and teach them a lesson. Thackeray also blasted the state additional chief secretary, Chitkasala Zutshi, and the state director general of police, Anami Roy, saying that due to their inefficiency and negligence the terrorists had dared to attack Mumbai. In Nagpur, the leader of the opposition and Sena legislator, Ramdas Kadam, echoed the words of his master. While speaking in the legislative assembly yesterday, he said: "Kasab should be publicly hanged at the Gateway of India and this public execution should be widely telecast." Meanwhile, the All-India Milli Council yesterday supported Thackeray's demand to hang without trial Kasab, said a spokesman in Panaji. Iqbal Mohideen, president of the All-India Milli Council (Goa), told reporters that Kasab's chilling crime should be judged through the Shariah (Islamic law). "The AIMC supports Bal Thackeray's demand. Even the Shariah says an eye for an eye, a limb for a limb and life for life," Mohideen said. One day a woodcutter took his grandson into the forest for his first experience in selecting and cutting oak trees. These they would later sell to the boat builders. As they walked along, the woodcutter explained that the purpose of each tree is contained in its natural shape: some are straight for planks, some have the proper curves for the ribs of a boat, and some are tall for masts. The woodcutter told his grandson that by paying attention to the details of each tree, and with experience in recognizing these characteristics, someday he too might become the woodcutter of the forest. A little way into the forest, the grandson saw an old oak tree that had never been cut. The boy asked his grandfather if he could cut it down because it was useless for boat building - there were no straight limbs, the trunk was, short and gnarled, and the curves were going the wrong way. "We could cut it down for firewood," the grandson said. "At least then it will be of some use to us." The woodcutter replied that for now they should be about their work cutting the proper trees for the boat builders; maybe later they could return to the old oak tree. After a few hours of cutting the huge trees, the grandson grew tired and asked if they could stop for a rest in some cool shade. The woodcutter took his grandson over to the old oak tree, where they rested against its trunk in the cool shade beneath its twisted limbs. After they had rested a while, the woodcutter explained to his grandson the necessity of attentive awareness and recognition of everything in the forest and in the world. Some things are readily apparent, like the tall, straight trees; other things are less apparent, requiring closer attention, like recognition of the proper curves in the limbs. And some things might initially appear to have no purpose at all, like the gnarled old oak tree. The woodcutter stated, "You must learn to pay careful attention every day so you can recognize and discover the purpose God has for everything in creation. For it is this old oak tree, which you so quickly deemed useless except for firewood, that now allows us to rest against its trunk amidst the coolness of its shade. "Remember, grandson, not everything is as it first appears. Be patient, pay attention, recognize, and discover." Indian civilization has surprised academicians time and again with simple age old techniques for solving complex problems. 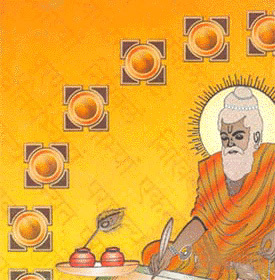 Vedic Mathematics, derived from the Ganita Sutra in the Vedas is one such technique. Vedic Mathematics is the name given to the ancient system of Mathematics which was rediscovered from the Vedas between 1911 and 1918 by Sri Bharati Krsna Tirthaji (1884 - 1960). In the beginning of the twentieth century, when there was a great interest in various Sanskrit texts in Europe, some scholars ridiculed certain texts which were titled GANITA SUTRA, which means mathematics. They could not decipher any mathematics in the translations and therefore dismissed the texts as rubbish. Bharati Krsna, who himself was a scholar of Sanskrit, Mathematics, History and Philosophy, studied these texts and after lengthy and careful investigation was able to reconstruct the mathematics of the Vedas. Bharati Krishna wrote sixteen volumes expounding the Vedic system but these were unaccountably lost and when the loss was confirmed in his final years he wrote a single book - Vedic Mathematics. It was published in 1965, five years after his death. According to his research all of mathematics is based on sixteen Sutras, or word - formulae. For example, ‘Vertically and Crosswise’ is one of these Sutras. These formulae describe the way the mind naturally works and are therefore a great help in directing the student to the appropriate method of solution. Perhaps the most striking feature of the Vedic system is its coherence. Instead of a hotchpotch of unrelated techniques the whole system is beautifully interrelated and unified. The multiplication method, for example, is easily reversed to allow one-line divisions and the simple squaring method can be reversed to give one-line square roots. And all are very easy to understand. This unifying quality is very satisfying; it makes mathematics easy and enjoyable and encourages innovation. In the Vedic system difficult problems or huge sums can often be solved immediately by the Vedic method. These striking and beautiful methods are just a part of a complete system of mathematics, which is far more systematic than the modern system. Vedic mathematics manifests the coherent and unified structure of mathematics and the methods are complimentary, direct and easy. The simplicity of Vedic Mathematics means that calculations can be carried out mentally (though the methods can be written down). There are many advantages in using a flexible, mental system. Pupils can invent their own methods; they are not limited to the one correct method. This leads to more creative, interested and interesting pupils. Interest in the Vedic system is growing in education where mathematics teachers are looking for something better and finding Vedic system is the answer. Research is being carried out in many areas including the effects of learning Vedic Mathematics on children, developing new, powerful but easy applications of the Vedic Sutras in geometry, calculus, computing etc. But the real beauty and effectiveness of Vedic Mathematics cannot be fully appreciated without actually practicing the system. One can then see that it is perhaps the most refined and efficient mathematical system possible. Why do we need to combine Pure and Vedic Mathematics? Schools all over the world utilize pure mathematics for their curriculum. Therefore an in-depth knowledge of pure mathematics is essential from the examination point of view. Unfortunately the mathematics that is taught is most schools and colleges lack flexibility and therefore become ‘boring’ to the students. On top of that many teachers lack the insight and knowledge required to teach the subject. Fixed methods are also used for all operations thereby making the process of calculation lengthy and tiresome. The right combination of Vedic and pure mathematics ensures correct understanding, extreme flexibility and an in-depth knowledge of the subject, thereby making calculations extremely rapid and interesting. This combination can be utilized for simple addition and subtraction, and also for more difficult operations like calculus, and algebra. Many of these operations can be done mentally. Therefore this can be used for students of all ages and standards. There are also wonderful methods for checking the sums. Utilizing this method, the student will become faster and more accurate in all-mathematical procedures. India on Thursday placed a key paramilitary organization, the Border Security Force (BSF), on high alert. Though there have been vague reports that Indian military forces have been on high alert since the Nov. 26 attacks in Mumbai, the BSF move is the closest we have come to seeing actual Indian preparations for war. And frankly, it is not very close. The BSF, which currently has 45,000 personnel deployed along the 2,030-mile border with Pakistan and also guards the border with Bangladesh, would not be involved in any major combat operations with Pakistan; its mandate is to prevent infiltration, not to carry out attacks. Indeed, more than three weeks after the Mumbai attacks, there has been nothing even remotely resembling the military buildup that occurred in the wake of the 2001 attack on the Indian parliament, when New Delhi deployed 750,000 troops in Kashmir within a week. Until now, we have seen New Delhi threaten to take action, and we have seen it join hands with the United States in pressuring Pakistan to take action against the various actors involved in the attacks, but there has been nothing measurable that could be convincingly described as preparation for a war. Given this stark contrast between the two situations, conventional wisdom would suggest that the clouds of war that were hovering over South Asia might have passed. A recent flurry of statements from very senior Indian officials, saying that they are not planning an attack against Pakistan, might make the conventionally wise feel even more at ease. Stratfor has learned, however, that Indian military operations against targets in Pakistan have in fact been prepared and await the signal to go forward. These most likely would take the form of unilateral precision strikes inside Pakistan-administer ed Kashmir, along with special forces action on the ground in Pakistan proper. Unlike the massive troop movements in 2002, these are not the type of operations for which preparations would be visible to the world at large. Sources have indicated to Stratfor that New Delhi is going through the diplomatic motions in order to give Pakistan the opportunity to take care of the militant problem itself —- but the Indians know that Islamabad has neither the will nor the capability to address their concerns. From a strategic perspective, the Indian government can no more afford to accept the Mumbai attacks and move forward than the U.S. government could have afforded to ignore the 9/11 attacks. New Delhi has little choice but to respond -— regardless of which political party is in power -— and because the perpetrators are linked to elements within the Pakistani state, the response must be directed against Pakistan. And if Islamabad will not cooperate in controlling the militants, India will have to take unilateral action. The Indians know that striking in Pakistan would not eliminate the Islamist threat —- but that would not be the aim of any such operation. Instead, India has to communicate firmly that it will no longer tolerate attacks from Pakistan-based militants —- whether they are rogue or approved by the state. Failure to do so risks emboldening the Islamists and their enablers, as well as a domestic political backlash. The Indian government could not live with either of those outcomes. The Pakistanis, for their part, also are showing subtle signs that they see India as likely to act. Pakistani daily The News reported Thursday that former President Pervez Musharraf had been forced to leave the country after security forces unearthed an assassination plot against him. Reports like this do not simply appear in the Pakistani press; they are carefully leaked in efforts to shape perceptions and behavior. In this case, the Pakistani army's central command is signaling to the Indians that the situation has spun so far out of its control that the safety of its own VIPs cannot be guaranteed. The underlying message is that any Indian plans for striking Pakistan will further weaken the tenuous writ of the Pakistani state, exacerbating rather than neutralizing the militant threat to India. It is not a very strong argument, and certainly not one the Pakistanis would be making if they did not think an Indian military action was in the works —- but Islamabad does not have many options left. thought the Nazis were a bunch of fools. So, the majority just sat back and let it all happen. vast majority of Muslims just want to live in peace. most killed by sword, shovel, and bayonet. of Rwandans were 'peace loving'? did not speak up until it was too late. who threaten our way of life. passiveness that allows the problems to expand. A Mouse who always lived on the land, by an unlucky chance, formed an intimate acquaintance with a Frog, who lived, for the most part, in the water. One day, the Frog was intent on mischief. He tied the foot of the Mouse tightly to his own. Thus joined together, the Frog led his friend the Mouse to the meadow where they usually searched for food. After this, he gradually led him towards the pond in which he lived, until reaching the banks of the water, he suddenly jumped in, dragging the Mouse with him. The Frog enjoyed the water amazingly, and swam croaking about, as if he had done a good deed. The unhappy Mouse was soon sputtered and drowned in the water, and his poor dead body floating about on the surface. A Hawk observed the foating Mouse from the sky, and dove down and grabbed it with his talons, carrying it back to his nest. The Frog, being still fastened to the leg of the Mouse, was also carried off a prisoner, and was eaten by the Hawk. MORAL : "Choose your allies carefully"
is obeyed out of love. there's the leader obeyed out of fear. The worst leader is one who is hated. they work with everybody else. They were deep. Real deep. like a man walking on thin ice. like a soldier behind enemy lines. like a guest at a party. They moved quickly, like melting ice. They were as plain as a block of wood. before you try to understand the world? before you do the right thing? Desire messes with your heart. The world messes with your mind. but keeps focused on what's real. Winning can be just as bad as losing. just as much as fear. "winning can be just as bad as losing" mean? you might be able to get up. you can get knocked down real fast. just as much as fear" mean? can get you in over your head. Walk tall, but don't get cocky. and nothing can ever hold you back. If you drink too much, you get drunk. if you're always tinkering with it. you fall into its clutches. Anything else will drive you nuts. "Doing the right thing" is like water.